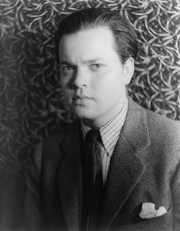 Orson Welles was gifted in many arts -- such as magic, piano, and painting -- as a child. After graduating from high school he skipped college in favor of a trip to Europe. Deciding to become an actor, he made his New York stage debut as Tybalt in "Romeo and Juliet" in 1934. He began working with John Houseman and formed the Mercury Theatre with him in 1937. In 1938 they produced the famous prank radio broadcast of "The War of the Worlds." Welles' first film to be seen in theaters was Citizen Kane (1941), considered by many to be the best film ever made. Appreciation of his talent and skill as a filmmaker has continued to climb since his death in 1985. Orson Welles is currently considered a "single author." If one or more works are by a distinct, homonymous authors, go ahead and split the author. Orson Welles is composed of 8 names. You can examine and separate out names.